Human generational study pinpoints epigenetic cause of Amyotrophic Lateral Sclerosis (ALS). Researchers at the University of Toronto have uncovered new insights on the genetic causes of Amyotrophic Lateral Sclerosis (ALS), also known as Lou Gehrig’s disease. These findings could uncover a new way to detect a genetic predisposition to ALS before the disease strikes. The team state that a common mutation associated with ALS is an unstable repeated DNA sequence within the C9orf72 gene that could reach into the thousands. However, it is unknown how many repeats would be sufficient to cause the disease. A way to predict if the number of repeats increases to the damaging range is the addition of methyl groups to the repeats. This modifies the DNA, shutting off production of C9orf72. The opensource study is published in the journal The American Journal of Human Genetics. The current study followed three generations of a single family. While the grandparents and parents in the family were healthy, four of five adult children possessed the repeat methylation, as a result of a damaging mutation in the C9orf72 gene responsible for ALS. Two of them have already died due to complications of ALS. The researchers explain that the cause of ALS is unknown in about 90 per cent of patients. The remaining 10 per cent are attributed to genes passed down through parents. Previous studies have shown that people with genetically acquired ALS have a parent with the disease. However, the current study found that neither parent nor grandparents had ALS. In most people, previous studies show that it’s common for the C9orf72 gene to have less than 30 repeats. The father examined in the current study had 70 unmethylated repeats, which is not sufficient to cause ALS. Yet, in his children the mutation expanded to more than 1000 repeats. While the father had an overexpression of C9orf72, the children had reduced expression of that gene. The researchers believe these factors explain how his children acquired ALS, while he remained unaffected. The team state that with further research they may be able to use this information to develop a genetic test that can identify if parents are likely to pass a mutation that may cause ALS in their offspring. They go on to add that by expanding this research to include other multi-generational families, as well as study unaffected parents, they hope to identify a range of C9orf72 repeats that can be used to predict a genetic predisposition to ALS in children. The researchers note that they were fortunate to have the opportunity to look at a multiple generation family, giving a much more complete picture of the genetic development between each branch of the family tree. ‘‘exp’’ represents the expansion allele. The age at time of examination is shown in the upper right corner. The age of death is indicated by a prefix of ‘‘d.’’ The age of onset is indicated for individuals with disease above the ID number. For protecting confidentiality, the gender of family members is masked. 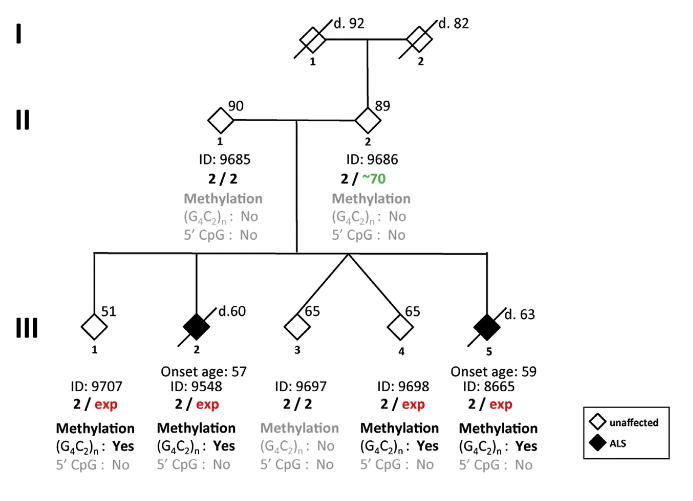 The results of methylation analyses for the 5′ CpG island and for (G4C2)n methylation are shown beneath the C9orf72 genotype. ‘‘Yes’’ represents the presence of methylation, and ‘‘no’’ represents the absence of methylation. Jump from Pre-mutation to Pathologic Expansion in C9orf72. Xi et al 2015.